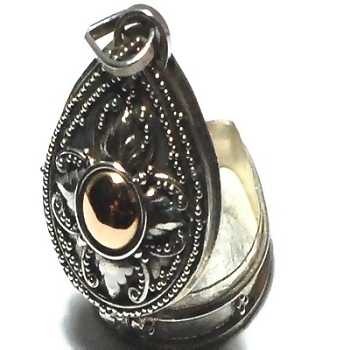 New 925 Sterling Silver Hand-Made Bali Tear Shape Prayer Box Pendant with a 18k gold layered in the center. 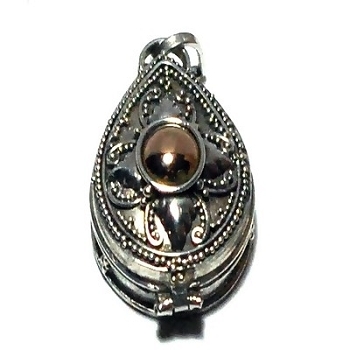 Layer gold is 18k gold that is layered on top of the pendant. It is not gold plated but actual gold. It looks like gold because it is gold. These Bali prayer boxes are also known as poison boxes, keepsake boxes, pill boxes, cremation pendant jewelry and lovers boxes. The pendant has a functioning lid that opens and closes to store your keepsakes.